Managing thousands of posts and dozens of drafts will be much easier in the upcoming WordPress 2.3 thanks to some revamped backend code and admin interfaces. First, the interface changes. In Manage -> Posts you can currently look for posts by search term, or browse by month or category, but only one of these things at a time. 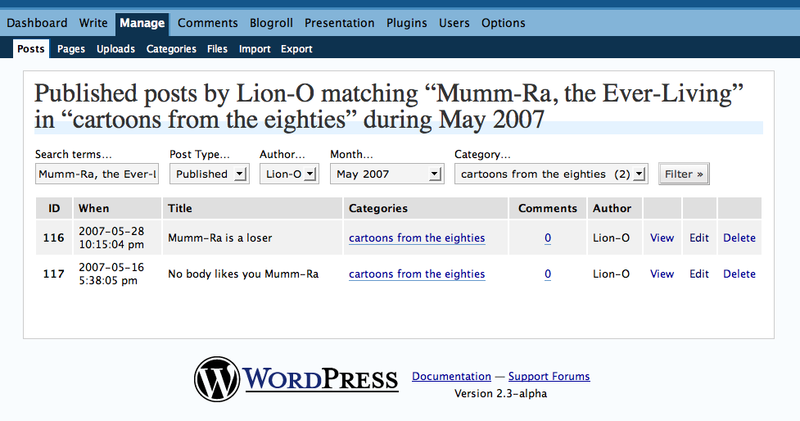 so you’ll be able to ask for all published posts written by Lion-O during May of 2007, filed in the “cartoons from the eighties” category, and matching the phrase “Mumm-Ra, the Ever-Living”. That was a hard list of posts to come by until 2.3. Manage -> Pages will be getting a similar face lift; you’ll be able to filter by search term, author and page type (draft, private, or published). Better draft management, in particular, has consistently been one of the most frequently requested improvements in WordPress, and these changes are a big piece of that. Secondly, the back end changes. The WP_Query class can now select posts by post_status (draft, future, private, publish). This makes it trivial to use query_posts() and wp() for such queries; no more need for kludgey filters and hacks. WordPress 2.3 comin’, at you soon. Be there! you guys are breaking all records , in a very short time. Pingback: WordPress Francophone » Quoi de neuf dans WordPress 2.3 ? Do you think, from the way this is implemented, that it will impact on plugins? I know impossible to be sure, but some guidance for those of us that have blogs with several plugins would be helpful… any words of wisdom?? Do you happen to know how we can filter password protected posts? Pingback: Slacking made easier » Blog Archive » Wordpress 2.3 What’s new? The draft management is fabulous. I have a slew of drafts and I can finally view them intelligently and make some decisions. Tagging, eh, I don’t care so much, but the admin improvements are great. I miss my del.icio.us plugin, Postalicious. There are a lot of del.icio.us plugins and only one (that I don’t want) is listed on the working-plugin list so far. I hope they get rewritten soon. I hope they get rewritten soon. I can’t rea your website in Saafrri 4.2, just figured I would tell you about it!